Being on a mission in Vegas is not an easy task, especially during CES week. We attended on behalf of 6 different publications this time, for reports on various subjects being presented all over town. That meant things were really busy. CES no longer is old-school consumer electronics. The days of simple color TVs and basic household appliances for entertainment are over. It seems all equipment now is partially a computer. Chips are built into everything. As of this year, these tiny dictators are starting to communicate with each other. The result is called an intelligent house that interacts with its habitants. These inhabitants will be chipped next to complete the picture. Here in Rotterdam, the first such victims are already walking among us. The Baja Beach Club injects chips into their customers so they can pay for their drinks hands-free. Go figure what will be next. Next to reporting on these and other new developments, of course audio was high on our to-do list of things. Being our own sponsors a part of this visit, we used certain portions of it for our own education. 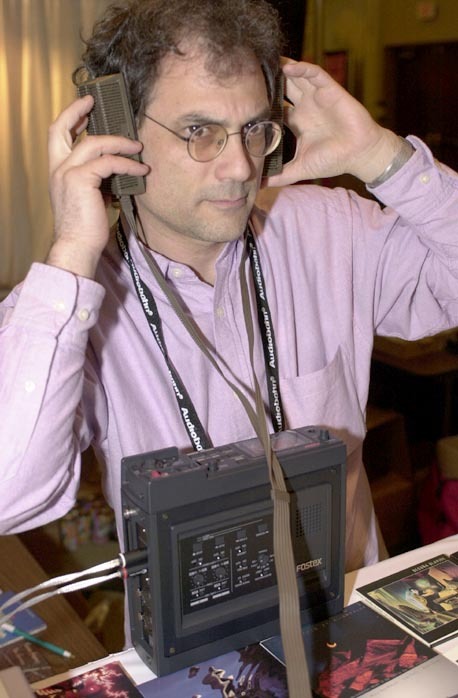 CES is an excellent opportunity to compare the various types of sound in the rooms one visits. How is the room set up? What kind of equipment is joined together to support the product the exhibitor is placing in the spotlight? Listening to the complete setup can thus be very revealing and promotes a 'field work' understanding that can lead to formal reviews. Perspective is the goal and attending CES is a means to get a better grasp on it. Of course as Europeans, we first had to get to Las Vegas. After some trouble leaving the country -- a member of the Dutch equivalent of the TSA did not like us -- the flight from Amsterdam to Las Vegas via Cincinnati was still 14 hours of "Sit Back and Enjoy the Flight". This is 14 hours in a very noisy environment. It could be our age but recovering from this endurance assault took a few days. It is not the fatigue or any pure bodily discomfort but the noise that affects the traveler the most. Going to a show where hearing is important, this presents some serious repercussions. Our schedule permitted us to arrive in Vegas a few days prior to the official show opening. During this period, there were countless press events, social sales parties and the like. Arriving a few days ahead gives your complex hearing physiology time to recover from this self-inflicted but unavoidable abuse. Stepping off a plane after a few hours leaves you with a serious depression in your hearing capabilities. The human body always tries to protect itself and simply blocks the frequency spectrum of the noise that attacks it. The first half hour or so on a plane, you are conscious of the 90dB+ background noise presented as pink noise. After that period, your brain just filters it out and stays in head-in-the-sand mode. The popularity of Bose's noise-canceling headphones on planes is thus explained. This headphone prevents the brain from the necessity of filtering out the noise, itself quite a task and one of the reasons why traveling by air can be tiring. In our case, no headphones but time to talk and enjoy a nice glass of bubbles plus some extra days to recover - Las Vegas here we come. With all the computer, wireless communication and related coverage done, it was audio education time. In preparation, a very good-sounding copy of some of the best music we own had been burned, with 'best' meaning a combination of emotional charge, physical response and sheer enjoyment. It happened to be the first track of Renaud Garcia Fons' Navigatore recording that packs all these qualifications together in 7:20 minutes. This track became the main player in our Tour the Fons 2005.
sufficient. The exhibitor must be the right sort, open to new experiences and loving what he/she is doing. Following are our recollections of the rooms where this atmosphere was spot-on perfect. The first room that qualified for our tour standards was Venture's. 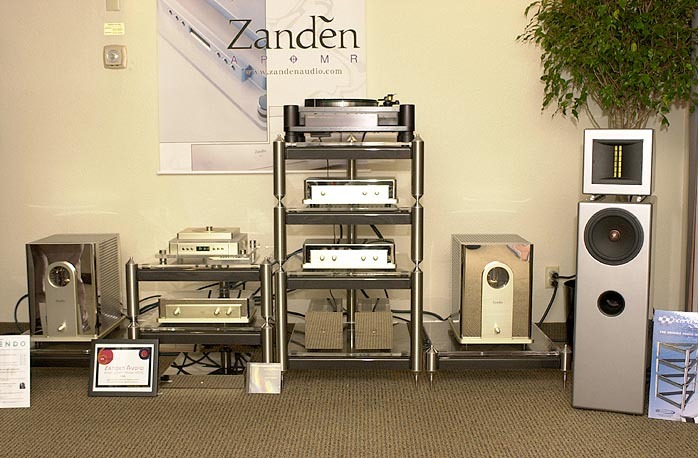 This Belgium company offers a wide range of products; loudspeakers, an amplifier and various interesting accessories like cables and damping platforms. 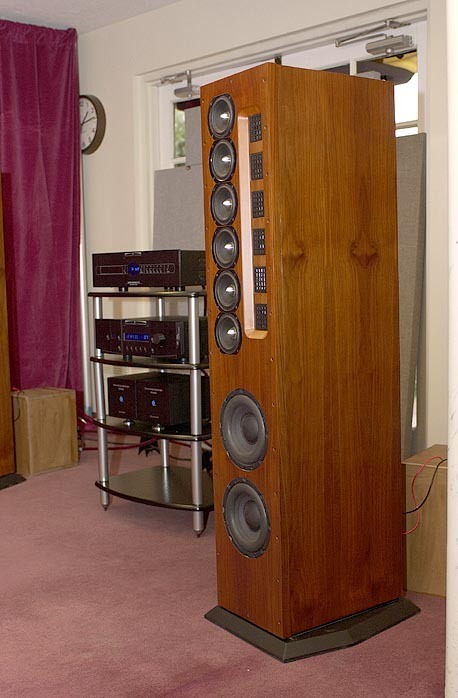 In their Alexis Park room, the large Grand Excellence fitted with ceramic graphite woofers and midranges and a diamond tweeter were coupled to their own Reference tube amplifier. Twenty watts from a 300B on steroids should brings Renaud Garcia Fons to life. And that is what this system did, presenting an open and detailed image, with the smallish room lightly treated to make the best compromise between leaving breathing space and bass reproduction. Probably due to this compromise, the bass extension was not what's expected from large loudspeakers. Getting very close to the goosebump/chickenskin effect, the harmonics of the track's 3:20 point where a trombone and a trumpet set in still did not do it for us. Here the first request for more information about the music being played was made. Many others would invariably follow. The next room with interesting possibilities was by Virtual Dynamics. 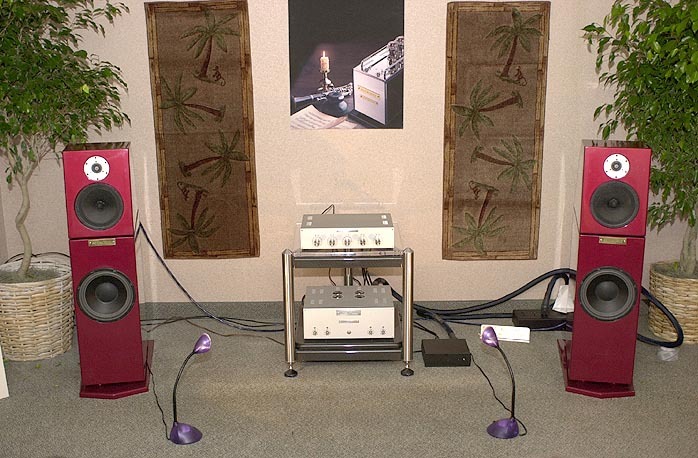 A Luminance CD player and amplifier were connected with Ascendo System E loudspeakers. A tangle of cables fit to induce drooling with Medusa's hairstylist connected it all. Canadian cable firm Virtual Dynamics is seeking improved cable behavior by means of reducing the cable's internal friction. The audible result here with RGF in the player were a bit disappointing. Though detailed and open, the sound was somewhat lean for our tastes. 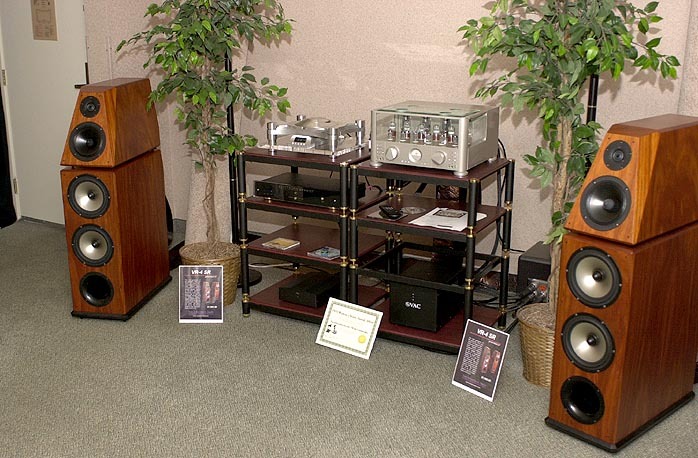 Later on, another room would display the same quality to our ears, using the same make of loudspeakers. Dutch speaker manufacturer Kharma was represented in a couple of rooms. One room was completely analogue so the Tour de Fons could take a break for us to catch up with Charles van Oosterum, the man behind the make. Never out of ideas and thoughts on how to improve the sound, it is always a pleasure to meet with him. 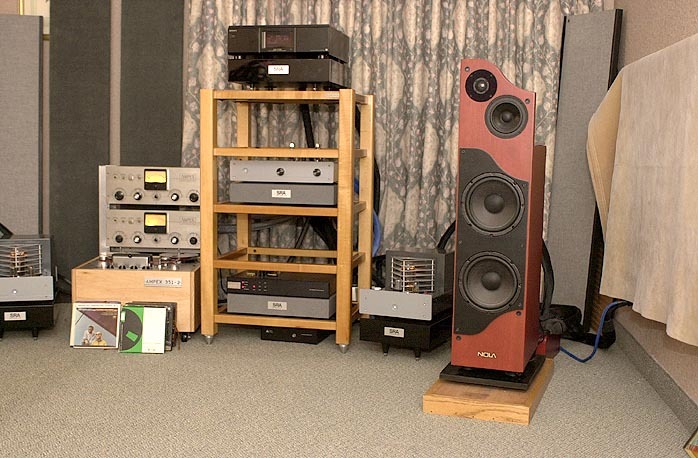 Another room used Kharma Ceramique 3.2 FE loudspeakers and subwoofer fed by Meitner's EMM Lab CD player and DAC, with amplification by Lamm and Kubala-Sosna for cables. This became the first room that triggered the involuntary physical responses to the music. Yes, the Tour de Fons was definitely getting there now, just enough slam to get the listener involved completely, timing spot-on. Needless to say, the timbral information was complete. The room housing Zanden did not sound as we anticipated. The overall sound was too laid-back, thin and not involving enough, too polite even as the music became forward. Just like in the Virtual Dynamics room, our suspicion pointed at the loudspeakers used. Sometimes you can't have it all. Over in the St. Tropez, the first stop of the Tour de Fons occurred at BAT's, with two setups presented in a fairly large room. 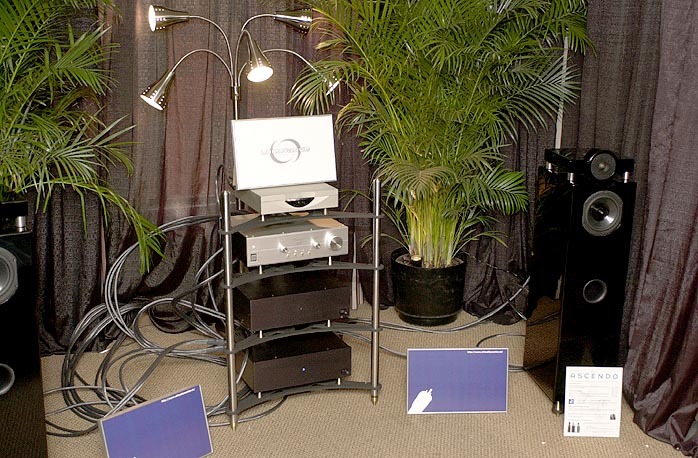 Sources and amplification were by Balanced Audio Technologies, cabling by Cardas, speakers the smaller 6-6 model with active subwoofer or the large 12-12 Epiphany towers. Once again the reception was warm and all attendees liked our music. The smaller system sounded a bit cluttered with the subwoofers on but when switched off, the sky cleared completely and a detailed rendition of "Navigatore" became our treat. Switching to the larger system, all emotions were triggered. This was a system to our liking. A bit bold but with enough rhythm and pace to pull you into the music and make you forget the room and the equipment. We were left with that wonderful glowing feeling in the chest. Junkies alert! balance. The seven minutes of sheer joy went by like a flash of lightning, leaving us and the audience in awe. Could this experience be equalled or topped? The lesson learned thus far was that a system should be fully submissive to the music. The moment a part of a system is noticed like "hey, there's a loudspeaker", it is off balance. There should be a flow in the air, enveloping the listener. That flow should be cohesive and not fragmented in one way or the other. Albert von Schweikert was the next destination in the Tour. An Oracle 2000 CD player fed a beautiful VAC Phi Beta amplifier while the air in the room was moved by Albert's latest VR4-SR. With higher sensitive than its predecessor and more bass extension, in went our golden copy and though the sound was different from the previous room, the emotions still got conveyed. The difference in sound or soundstage could have been due to the fact that the VR4s use a backfiring tweeter for ambience retrieval. This produces a different soundstage and for our taste, it should have been adjusted a little but this was how Albert had set up the system so we sat back and let the music do its work. Any suggestions of actual depth and width from the room were superseded by the soundstage - the front wall was not as near as in actuality and the musicians spread out wider than with other systems so far. This effect caused the music to be more detailed in perception, not unpleasant at all. All the attendees in the room got mesmerized by the music and even Albert was tapping his feet and moving along. 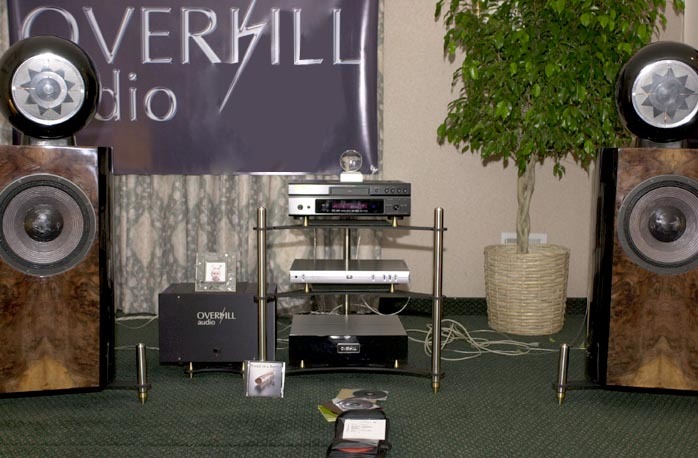 Overkill Audio had made a lasting impression at the London Heathrow show last year. 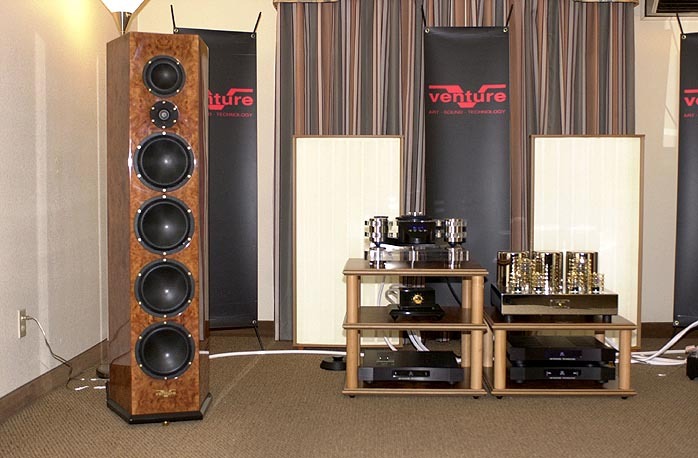 Now in the St. Tropez with their own four-channel David Belles amplifier, they became part of the tour. What struck us immediately was the speed of their system, with something of an electrostat's directness. Deep bass was fully present yet without the sluggishness that often plagues systems with large woofers. The huge range the Manger driver is capable of added to the point-source effect and a very realistic depiction of the music was the result. The word best describing the system -- and Overkill only sells complete systems -- is pleasant. Unlike other big systems that elicit "oohs" and "aahs" during the first couple of minutes only to get boring thereafter, the Overkill system was a bit of an acquired taste. To fully appreciate it, the listener had to first open up and let the system charm him. Once that step was taken, the endorphin drip kicked in. The Pranawire/deHavilland/Nola room always sounds among the very best. The tricks Kara Chaffee and Joe Cohen pull off time and again belie the adage that rooms at shows cannot work properly and consistently each time. Well, some exhibitors can. 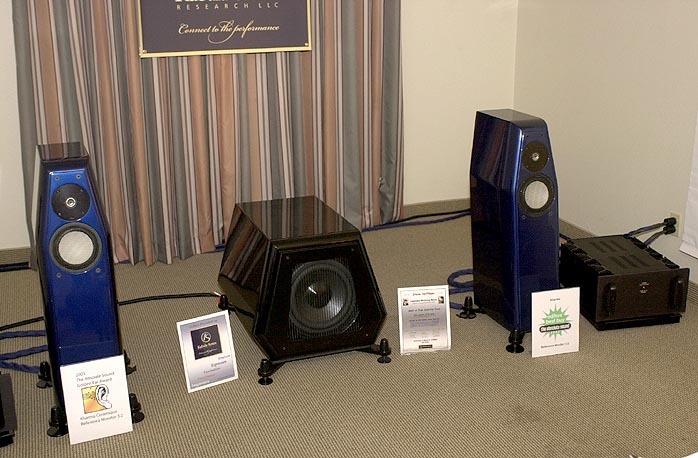 Here, the Nola loudspeakers were set up at an angle, the imaginary line between both speakers not parallel to the front wall nor the back wall. Try this at home and observe the result. Playing "Navigatore" via the Russian GM70-powered amplifiers from a Sony CD player produced the tightest sound of the show. No ringing whatsoever - a hit to a drum had a definite beginning and end. The sound possessed no inherent sweetness but as with a good champagne, it can never be too dry. Nuances and articulation were presented with a sense of natural innocence. Then the tour had come to an end. Further endorphin rushes were clearly not advisable. The sun had set in Vegas and back at the Alexis, the new lighting system showed a difference over last year. Many of the buildings had already been repainted in a sort of Tuscan wash. No more drab beige but instead a friendly reddish earthen tone now adorns the facades. Inside the main frontal complex now dubbed Convention Center, a stop at Ma Recordings' Todd Garfinkle stand became mandatory. Not only did he surprise us with some samples from yet-to-be-released recordings, but he also showed off his latest recording gadget, a Flash Card recorder. No more moving parts - all recording is done straight to removable memory. It's convenient, affordable and great sounding. The convergence of audio and computer technology is unstoppable after all. Before heading home to our hotel, we hit the new Alexis Park bar. Listening to so much music makes you forget to replenish the fluids. Here we enjoyed a chance encounter with the new owner of the resort hotel. He proudly showed us the new discotheque he installed. He wants to recreate the Old Vegas style, the flashy neon era of the 70s. That also means he is reconsidering the contract the Park has with the CEA. As one of the few non-gambling resorts in Vegas, the new owner can make more money from renting rooms to the public than with the fixed price deal he gets from CEA. If the Alexis Park is no longer part of CES and -- as CEA announced -- the Sands might become the new home for the high-end leg of the CES, there will be a lot of changes. 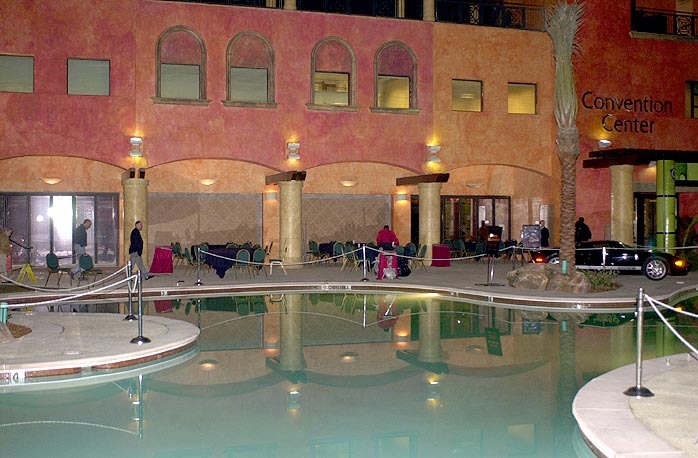 The Sands is also home of the Adult Entertainment Show during CES week. different though all sounded like music. A clear picture is emerging of what kind of reproduction is most to our liking. All the efforts put into our own system have not been in vain after all. It is getting towards that point where you can honestly say that you are more than pleased with it. The tour also taught us that whenever a new component is introduced, one first has to retune the system back to one's liking. Only then can the novice be judged fairly.